Throughout Africa, chickens are vital to family nourishment, income and food security. But African poultry production is threatened by an extremely virulent Newcastle disease virus that can decimate entire flocks within days. UC Davis researchers are leading an international effort to identify genes crucial to breeding chickens with enhanced resistance to Newcastle disease and heat stress. Their project–the Feed the Future Innovation Lab for Genomics to Improve Poultry–recently received a $5 million award from the U.S. Agency for International Development (USAID) to continue its work improving poultry production in Africa and throughout the world. "This project will help protect chickens from deadly Newcastle disease in areas where poultry vaccinations are not feasible, as well as boost the effectiveness of vaccinations," said Huaijun Zhou, the UC Davis geneticist and animal science professor leading the international multidisciplinary team. Zhou is program director of the innovation lab and the U.S. national poultry genome coordinator. "Increasing the production of chicken and eggs can have a dramatic impact on nourishment and livelihoods in poor, rural communities. Small, backyard flocks are a staple for households in developing countries and provide the income and sustenance families need to survive. Raising indigenous chickens is a relatively minor investment compared to cattle, goats and other livestock because birds scavenge for food and live outdoors without housing. Indigenous chickens are predominantly raised by women and children. "Eggs are an almost complete protein, rich in both macro- and micronutrients, including essential fatty acids, choline, vitamins A and B12, which are usually deficient in poor families and not all available in other foods," Zhou says. "Chicken meat and eggs are crucial to helping protect children from stunting and other forms of malnutrition." Zhou and his team are using genetics and genomics to improve host immunity to Newcastle disease infection. 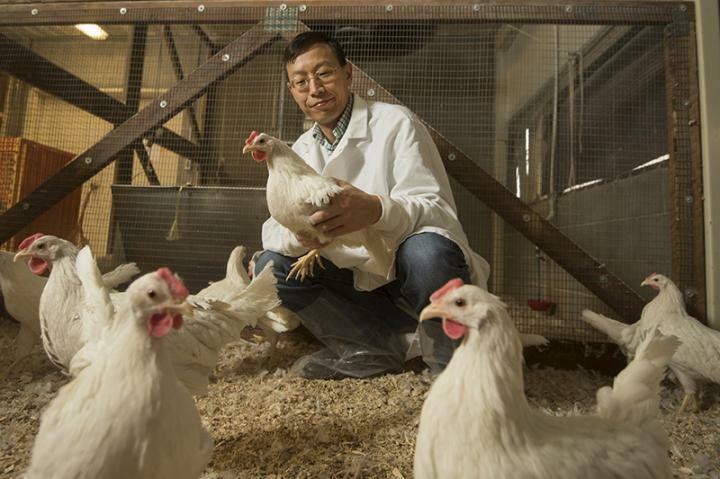 "We're working to identify chicken genes or genetic markers associated with resistance to Newcastle disease and heat stress, as well genetic markers related to egg production and growth rate," Zhou said. "This genomic approach won't replace vaccinations, but rather complement them by providing enhanced immunity." "Each gene involved tends to contribute a small genetic effect, making them hard to detect," Zhou said. "It's a tremendous challenge." "We have already identified hundreds of genetic markers associated with Newcastle disease resistance and heat resilience, and there is more work to be done," Zhou said. The team also has expanded the workforce needed to sustainably improve smallholder poultry production in Africa by renovating facilities at universities in Tanzania and Ghana, training scientists, supporting students, and building partnerships with private, governmental and non-profit poultry groups. "We're conducting market assessment and developing business models so that these discoveries can be scaled up and applied to assist local poultry producers," Zhou said. "Our goal is to provide lasting impact to the health and welfare of families in Africa and across the world." At UC Davis, Zhou is collaborating with Deputy Director Terra Kelly from the One Health Institute and Professor Rodrigo Gallardo from the School of Veterinary Medicine. The UC Davis team is working with Professors Sue Lamont and Jack Dekkers, both at Iowa State University; Professors Boniface Kayang, Augustine Naazie and Hope Otsyina at the University of Ghana; Professors Amandus Muhairwa and Peter Msoffe of Sokoine University of Agriculture in Tanzania; and Emily Ouma and Steve Staal, economists at the International Livestock Research Institute in Kenya. The U.S. Agency for International Development is an independent agency that provides economic, development and humanitarian assistance around the world in support of the foreign policy goals of the United States. USAID promotes peace and stability by fostering economic growth, protecting human health, providing emergency humanitarian assistance and enhancing democracy in developing countries. Feed the Future is the U.S. government's global hunger and food security initiative. UC Davis manages four of the U.S. government's 22 Feed the Future Innovation Labs and is a primary partner on a fifth lab. The projects draw on the expertise of top U.S. colleges and universities in collaboration with developing country research and educational institutions to tackle some of the world's greatest challenges in agriculture, food security and nutrition.